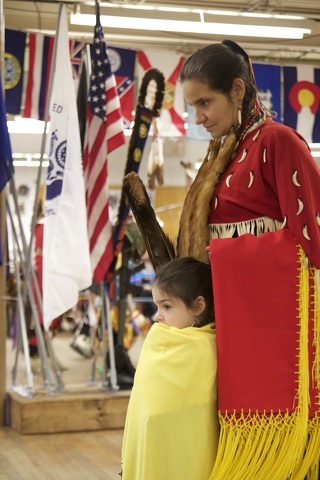 Victoria Sanchez and her granddaughter Cheyenne at the powwow in 2015. The 15th annual Penn State Powwow will be held April 6 from 11 a.m. to 9 p.m. and April 7 from 11 a.m. to 5 p.m. at Mount Nittany Middle School. The powwow, a celebration of community and culture, features American Indian drummers, dancers, vendors, and delicious cuisine. It is is free and open to the public. Event co-coordinator Dr. Victoria Sanchez, who is also the associate dean for educational equity in the College of Earth and Mineral Sciences, discussed the Powwow with Town&Gown. T&G: Take us through the weekend. What do you have planned for the Penn State Powwow? Sanchez: The Penn State 15th annual traditional American Indian Powwow is a two-day event. There are about 25 carefully selected vendors, a native kitchen where you can get a taste of Indian country, drummers, and then there will be many different dance styles in the arena, which is the heart of the powwow. The vendors sell authentic Indian art and jewelry such as beaded earrings, silver, turquoise, books, and supplies to make powwow regalia, which is the clothing the dancers wear to represent their dance style, tribal tradition, and creativity. The vendors comply with the American Indian Arts and Crafts act, which requires that everything to be sold there is actually made by native people. This year, we have six huge drums and 150 dancers that come from all over like Canada, Washington, the Dakotas, New York, and more. The drums give an incredible deep sound that you feel through your body. It’s really cool because children love it. The food is amazing; authentic and affordable. Our head cook, Mike Zerby, is from the Potawatomi Nation and is incredible. You can expect fry bread, Indian tacos, corn soup, and the buffalo burgers that sell out pretty quickly. T&G: What is the history of the Penn State powwow? Sanchez: The powwow began 15 years ago, with a one-year hiatus in between. Before this we actually did a mini powwow event that was part of the celebration of our American Indian leadership program’s 30th anniversary in 2001. That just had a tremendous outpouring of interest from the community and Penn State’s administration. So, it took us a couple years to plan, but we did it. It started with a few drums, a handful of dancers, and vendors. We thought a few people would come, but it turned out people packed the room with huge support and that’s when we made it into a weekend. For years now, we bring in about 6,000 people from central Pennsylvania and beyond. T&G: What purpose do you feel this event serves in the community? Sanchez: People enjoy it because they interact with the native community in a way that they otherwise might not be able to. They have the opportunity to get to know people and make friends. Year after year, you see each other and catch up. The people that work for us tell me they really appreciate the community, since they see them every year. T&G: What is your role and the tasks others do to make the powwow a success? Sanchez: It takes a number of people to make this powwow a huge success. My husband, John Sanchez, is the coordinator and he has been since its inception. I assist him as the co-coordinator. We have a very active, very dedicated, and wonderful planning committee, which takes a full year worth of planning. Over the course of the weekend, we have almost 200 volunteers that are in the kitchen prepping, running food to the drummers, directing traffic in the parking lot, set up, and tear down. A lot of people, time, and care goes into this weekend. T&G: How has this event’s popularity grown since it started 15 years ago? Sanchez: It’s grown quite a bit over the years. One of the things, at the very beginning people didn’t necessarily understand what a powwow is and what to expect. So, a lot of people really made a grand entry at noon to see the dancers and then it would drop off. People finally learned that the dancing is continuous throughout the day. The same people attend each year and make a day out of it with their families. We’ve had so many people tell us they save their money all year long and bring their shopping list for birthday gifts and things. T&G: What is your favorite part of this weekend? Sanchez: That is really hard to pin down and have one favorite. You know, the best part about it is the feeling you get from being there. For anyone who comes, this isn’t a spectator sport. You walk through the doors and you’re part of the event. It just has a really good feeling to it from the community that keeps coming back. People tell us after the powwow how much they feel comfortable there and it makes us happy. It has a really good energy around it. It’s so much culture in real time. It’s based in very deep traditions and we honor and respect those so much. It’s not about looking backward, it’s about looking forward and carrying this tradition into the future. For more information, visit bellisario.psu.edu/powwow.